Margaret McIntosh and Heros. Photo by Lindsay Y. McCall. Wellington, FL – January 8, 2018 – United States Para-Dressage riders ended a fantastic weekend earning an unprecedented number of scores over 70. Top Grade I rider and 2016 Paralympian from Reading, Penn., Margaret McIntosh, rode Heros to the overall highest individual score. Equestrians from the USA and Canada competed at the 2018 Adequan Global Dressage Festival (AGDF) CPEDI3* Week 0, January 4-7, sponsored by By Mission Control, Rowan O’Riley supporting athletes in the USPEA and US Equestrian, and Cargill. It was an exciting three days in Wellington with unseasonably cold temperatures and high winds but the importance of this international show could be seen from the outstanding scores. For Para-Dressage athletes in Grade I-V, the AGDF shows (Week 2 is January 18-21) are two of only three stateside opportunities left to secure their FEI certificates of capability for the FEI World Equestrian Games™ Tryon 2018. These shows are also a chance to showcase their rides in front of the FEI Ground Jury consisting of Dr Jan-Holger Holtschmit (GER), Kristi Wysocki (USA), and Sarah Leitch (GBR). The Deloitte U.S. Para-Equestrian Dressage Team earned Gold with USA Teammates Margaret McIntosh, Roxanne Trunnell, Michele Bandinu, and Katie Jackson. The USA Team was led by Chef d’Equipe Kai Handt with US Equestrian Head of Para-Dressage Coach Development and High Performance Programs Michel Assouline. It was a weekend of record breaking with the largest amount of US Entries in a CPEDI and the greatest amount of riders earning over a 70 or even the high 70s in a CPEDI. Kai Handt commented, “We had a very large competition and we will do it again in another week. It was a great weekend that began with some inclement weather on the first day of schooling. A lot of people got a little nervous in the beginning but our riders are used to dealing with all types of atmospheres and weather and their scores in the show ring showed that. We had some new team members this week and our system changed where our selection committee picks the team instead of the Chef. Assouline was instrumental in 2017 with his wife Mette and Margaret McIntosh’s Coach Missy Ransehousen finding McIntosh her new horse Heros. The duo dominated the CPEDI at Global posting scores in the high 70s over the weekend solidifying their partnership for the 2018 year. Trunnell rides with Chef d’Equipe Kai Handt at the North Texas Equestrian Center along with Grade V top rider and U.S. teammate Katie Jackson. Only one year ago, Jackson was looking at her first CPEDI competition in The Stadium, and in October 2017 Jackson took over the ownership of this high performance horse Royal Dancer. Also from the West Coast was Alanna Flax-Clark (Los Angeles, Calif.) who flew out to the East Coast to work with Sara Schmitt Dressage LLC. Flax-Clark secured the Grade II win with Captain Moonlight TG. This was her first CPEDI3* and first time in Wellington, FL. “It was a great show,” stated Flax-Clark. “I have only been riding him a few weeks but he is fantastic. He had to learn a lot for our partnership to work and he learned quickly. He’s a smaller horse with big gates and as soon as he enters the show ring he knows to turn it on. I enjoyed the ride this weekend and I am thankful for all of the support from California, New Jersey, and here in Florida. In Grade III Rebecca Hart (Unionville, Penn.) finished the weekend with a 74.167 in the Freestyle competition and obtained the Grade III championship. As a Three-time Paralympian (2008, 2012, 2016) and two-time WEG athlete (2010, 2014), Hart is comfortable with the electric atmosphere of The Stadium at AGDF. So when Hart and her new mount El Corona Texel paraded down centerline Hart showcased her horse’s power and finesse. 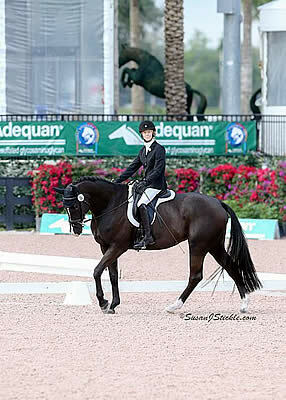 In Grade IV Annie Peavy, 2014 WEG athlete and 2016 Paralympian, performed outstanding with Royal Dark Chocolate. Peavy (Avon, Connecticut) and Royal Dark Chocolate overtook Grade IV with scores in the middle 70s. Together they were the reserve champion high point rider. Sydney Collier and Western Rose. Photos: ©SusanJStickle. Wellington, FL – January 9, 2016 – The CPEDI 3* presented by Mane Stream, courtesy of Rowan O’Riley, Mission Control, Adequan®, and Nutrena continued today at the Adequan® Global Dressage Festival (AGDF) grounds of Palm Beach International Equestrian Center (PBIEC), as competitors completed the team component of the weekend’s competition. Team USA maintained their lead throughout the two-day portion of competition, ultimately capturing first place honors. Team Canada finished in second place. CPEDI3* competition continues tomorrow with individual freestyles beginning at 9am. U.S. riders displayed spectacular talent throughout the second day of competition at AGDF as Margaret McIntosh (USA) and her own Rio Rio impressed in the FEI Para-Dressage Individual Championship Test – Grade 1a with a score of 72.899%. Sydney Collier (USA) continued to improve her marks from yesterday, leading the FEI Para-Dressage Individual Championship Test – Grade 1b aboard Western Rose, owned by Wesley Dunham, receiving a 66.609%. The talented duo of Rebecca Hart and her own Schroeter’s Romani earned another fabulous score in the FEI Para-Dressage Individual Championship Test – Grade II division with a 73.095%. Angela Peavy (USA) piloted Lancelot Warrior, owned by Heather Blitz and Rebecca Reno, to another win over the weekend, earning a 72.561% from the judges in the FEI Para-Dressage Individual Championship Test – Grade III. 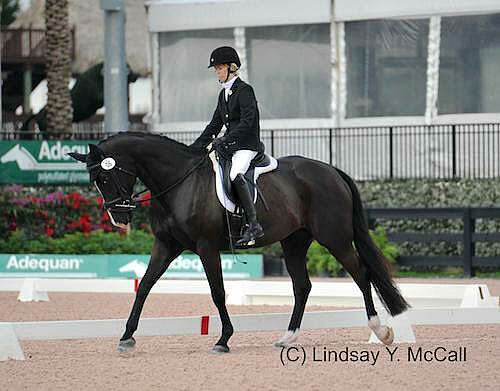 Mary Jordan (USA) won the FEI Para-Dressage Individual Championship Test – Grade IV aboard Rubicon 75, owned by Vinceremos Therapeutic Riding Center. Sydney Collier has excelled this week for Team USA, competing two gifted mounts and placing exceedingly well aboard her relatively new ride, Western Rose, owned by her trainer Wesley Dunham. Collier has narrowed her focus on adjustments and improvements noted in the judging remarks for each of her rides, which she hopes will help increase her scores and gain confidence before the 2016 Paralympic Games in Rio de Janeiro this summer. Collier, who was diagnosed with a very rare congenital birth defect known as Wyburn-Mason Syndrome at age seven, has taken the equestrian world by storm after being named 2014 Junior Equestrian of the Year presented by the United States Equestrian Federation and serving as a member of Team USA at the 2014 FEI World Equestrian Games (WEG) in Para-Dressage in Caen, France. Entering the first CPEDI 3* of the 2016 calendar year, Collier has been eager to expand her competition experience aboard both of her newer mounts, Western Rose and Scampano 2, as well as continuing training with her additional mount, Wentworth, who is already qualified for the 2016 Paralympic Games. “Western Rose has been amazing to work with. She’s really fun because she has her own engine so I really just have to manage her gaits. All three of them bring a smile to my face every day when I get to ride them,” she smiled. Competing at AGDF has always been a highlight for Collier each year, noting that competing in the Global International Arena in 2016 will be incredibly helpful for riders looking to gain experience in a large venue setting. Margaret McIntosh and her own Rio Rio concluded a phenomenal 2015 season and are beginning the 2016 circuit on the right foot, as the duo continues to string together excellent performances in the FEI Para-Dressage – Grade 1a division. McIntosh, who rides with Missy and Jessica Ransehousen out of Unionville, PA, also has her sights set on the U.S. Paralympic Team heading to Rio de Janeiro. McIntosh, a former three-day eventer, began competing in para-dressage competition after a riding accident left her initially paralyzed from the chest down. Now, McIntosh is looking forward to earning a spot representing the United States for the first time ever in international Para-Dressage competition in 2016. The duo received a 72.754% and earned an improved 72.899% today in Grade 1a competition. Correction from January 8, 2016 Release: Mary Jordan and Rubicon 75 owned by Vinceremos Therapeutic Riding Center, also competed on the first day of CPEDI 3* at AGDF, earning top honors in the FEI Para-Dressage Team Test – Grade IV with a score of 60.595%. For more information on the CPEDI3* and to see a full list of ride times and results, please visit www.globaldressagefestival.com. Sierra Keasler stands with Margaret McIntosh on Delorean MF at the USEF High Performance Southeast Para Equestrian Dressage Symposium (Photo courtesy of Al Guden). Wellington, FL (January 26, 2015) — When Caroline Roffman received an email from Margaret McIntosh inquiring about borrowing a horse for the USEF High Performance Southeast Para Equestrian Dressage Symposium, Roffman immediately wanted to help. Accomplished para-equestrian McIntosh asked for just two things: a horse with a good mind and a great walk. Roffman explained that McIntosh is a talented rider who enjoyed a successful eventing career with the help of Bruce Davidson, which led to her competing in the CCI*** and CCI**** at the Rolex Kentucky Three Day Event in 1997 and 1998 before a life-changing accident. While riding in an event in 1999, McIntosh fell over a cross country fence and broke her neck. Her equestrian career would never be the same. 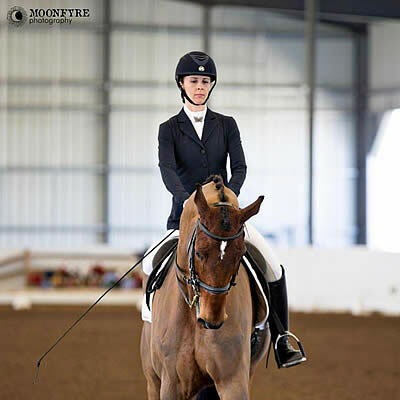 Although she was initially paralyzed from the chest down, McIntosh was able to regain her mobility and get back in the saddle as a para-equestrian. McIntosh now trains with Missy and Jessica Ransehousen. She has risen back through the equestrian ranks, earning the title of 2014 USEF Para-Equestrian Dressage Reserve Champion. Unable to bring her own Rio Rio to Wellington for the Symposium, McIntosh looked to Roffman for the perfect ride. 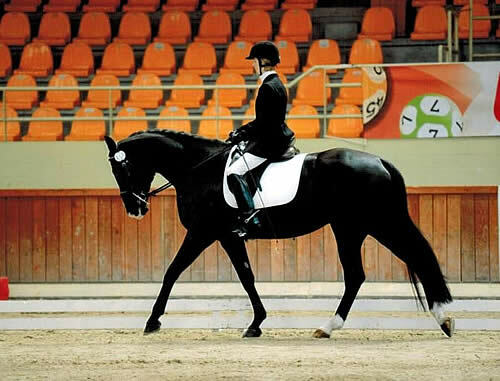 McIntosh competes in para-equestrian dressage at Grade 1(a), a classification in which riders walk their dressage tests. Although she just barely missed the mark for the 2012 London Olympics Selection Trials and she was unable to compete in the 2014 Alltech World Equestrian Games due to a classification discrepancy, McIntosh continues to push forward in her competitive career. Her sights are set on qualifying for the 2016 Olympics in Rio de Janeiro. Thanks to supporters such as Roffman and Keasler, her dreams of competing on a U.S. Olympic Team are in reach. For more information about Roffman and her top-quality dressage training, lessons and sales business Lionshare Dressage, visit www.lionsharedressage.com, email lionsharedressage@gmail.com, or call 617-633-1003.